The 2018 Gwyn B. Price Scholarship and Katie Bunch Scholarship were recently awarded to Youth Tour participants from Union Power Cooperative and Rutherford EMC, respectively. Each student will be recognized at the statewide annual meeting in April, along with EnergyUnited Youth Tour delegate Chetan Singalreddy, the recipient of the 2018 Youth Leadership Council Scholarship. Emily Eget, a 2017 Youth Tour delegate for Union Power Cooperative, is the 2018 Gwyn B. Price Scholarship winner and will receive $2,500 to go toward her college education. Eget co-founded the senior mentors initiative at Porter Ridge High School in Indian Trail and serves as president of the governmental studies club. She is also a student council representative and participates in various community service clubs. She plans to attend Columbia University and study political science. 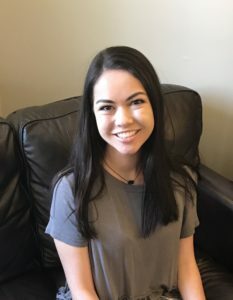 Julia Murrow, a 2017 Youth Tour delegate for Rutherford EMC, is the Katie Bunch Scholarship winner and will receive $2,000 to go toward her college education. She is a senior at Highland School of Technology in Gastonia, where she serves as co-president of the Moot Court team and is involved in a wide variety of activities including the Teen Action Council, Future Business Leaders of America, Homecoming Court, National Beta Club and Junior Leadership Gaston. She plans to attend Duke University and obtain a double major in political science and neuroscience. 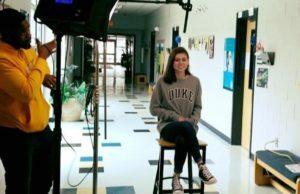 Julia Murrow during the filming of her scholarship video to be shown at our statewide annual meeting. Each scholarship winners’ accomplishments will be highlighted in videos shown at the annual meeting. Follow updates and news about the next round of Youth Tour participants at facebook.com/NCYouthTour.